This book provides a conceptual history of global civil society and a critical examination of the politics of resistance in the global political economy. It uses a dialectical method of analysis to illustrate the conceptual stasis of mainstream approaches to questions of globalization and contestation, while demonstrating the potential of a Gramscian approach to reconstitute hegemony as a key analytical and explanatory tool. 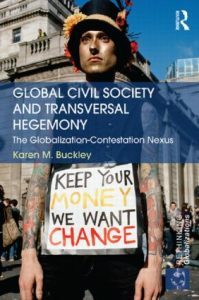 Buckley offers insight to the movements of transversal hegemony and existent and anticipated modes of social relation through the case studies of the World Social Forum and the World People’s Conference on Climate Change.